Araceli Rodriguez, left, mother of the late Jose Antonio Elena Rodriguez, speaks outside the federal courthouse with supporters after Border Patrol agent Lonnie Swartz was found not guilty of involuntary manslaughter in Jose's cross-border shooting death, Nov. 21, 2018, in Tucson, Ariz. The family of the late Jose Antonio Elena Rodriguez, including mom Araceli, left, and grandmother Taide Elena, second from left, leave the federal courthouse with supporters after Border Patrol agent Lonnie Swartz was found not guilty of involuntary manslaughter in Jose's cross-border shooting death, Nov. 21, 2018, in Tucson, Ariz.
Taide Elena, grandmother of the late Jose Antonio Elena Rodriguez is consoled by supporter Isabel Garcia at the federal courthouse, Nov. 21, 2018, in Tucson, Ariz. Border Patrol agent Lonnie Swartz was found not guilty of involuntary manslaughter in Jose's cross-border shooting death. The view north into the U.S. in 2012, from the corner where Jose Antonio Elena Rodriguez was shot by a U.S. Border Patrol agent firing down from the fence and into Nogales, Sonora. Araceli Rodríguez helps carry a banner through Nogales, Sonora, during a march earlier this year in memory of her son, Jose Antonio Elena Rodríguez, who was killed by a Border Patrol agent in 2012. Richard Boren, with the Border Patrol Victims Network, is arrested by federal protective service officers after his third warning to vacate federal property outside the federal courthouse, Nov. 21, 2018, in Tucson, Ariz. Boren was with protesters demonstrating after Border Patrol agent Lonnie Swartz was found not guilty of involuntary manslaughter in Jose Antonio Elena Rodriguez's cross-border shooting death. 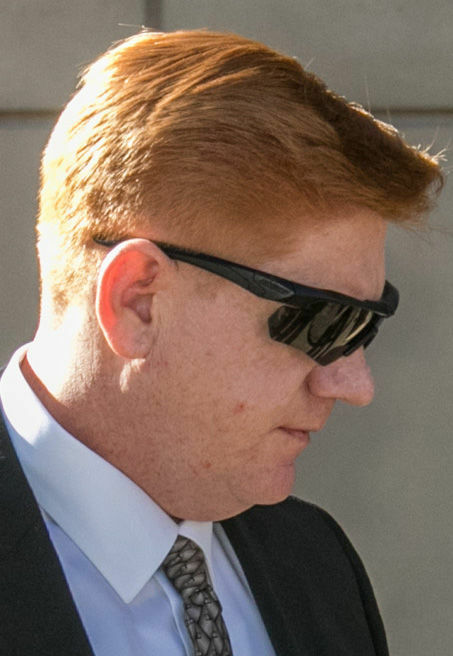 Jurors found Border Patrol agent Lonnie Swartz not guilty of involuntary manslaughter, two hours after they told the judge they were deadlocked and he told them to keep deliberating. The acquittal came Wednesday in the Tucson courtroom of U.S. District Court Judge Raner Collins. The jury didn’t fill out the verdict form on a voluntary manslaughter charge, so prosecutors are arguing Swartz could be tried again, but defense attorneys say otherwise. Because the agent was acquitted of the lesser charge of involuntary manslaughter, he cannot be retried on the higher charge of voluntary manslaughter, the defense attorneys said. The judge set a status conference on the case, and those questions, for Dec. 11. Swartz was on trial for the second time in the 2012 cross-border shooting death of 16-year-old Jose Antonio Elena Rodríguez. He said that Swartz, who is on administrative leave, was weeping and relieved. Chapman said he didn’t know whether Swartz will return to the Border Patrol. While the prosecutors couldn’t comment on the verdict, Assistant U.S. Attorney Wallace Kleindienst said they respected the jury’s decision. Collins told the jurors they could go downstairs to the jury room if they wanted to speak with news reporters, but none did. Earlier in the day, Collins had instructed the jurors to continue to deliberate after they sent several notes to the court on Tuesday that they were deadlocked. "Judge Collins, we are a hung jury, on both charges and are unsure what the next steps are," the first note said. "Please continue to deliberate," Collins told them. They later sent a second note saying that they had come to a decision that they would not be able to reach a unanimous decision, to which Collins asked if they could return Wednesday to try again. After they sent a third note saying "we are all in agreement we will not reach an agreement regardless of how much more time we spend deliberating," Collins told them to return Wednesday to receive further instructions. Chapman asked for a mistrial Wednesday morning saying asking jurors to continue to deliberate after they had said several times they were deadlocked would be coercive, but Collins denied his motion. The jury had deliberated for 14.5 hours, Collins said, on a case that went on for 13 full days and included close to 100 hours of testimony. Swartz was acquitted of second-degree murder charges in April, but the first jury wasn’t able to make a decision on the lesser manslaughter charges. They too had sent notes early on that they weren't able to reach a unanimous decision. The government decided to retry the case and the second trial began Oct. 23. Jurors had began deliberating Friday afternoon. “Justice was done correctly,” said Art Del Cueto, who represents the Border Patrol union, after the verdict was reached. The union is “here to support our agents when we think there’s been an injustice,” he said. Six years earlier, on Oct. 10, 2012, Swartz fired his pistol through the Nogales border fence 16 times in 34 seconds, from three different positions, in response to rock throwers. The government indicted him nearly three years later in September 2015. Elena Rodríguez was struck eight times in the back and twice in the head. The federal government argued Swartz’s use of deadly force was not justified and that the agent had continued to shoot the teen, while he was still alive but on the ground, because he was fed up. While defense attorneys didn’t contest that the agent shot and killed the teen, they argued it was in self-defense. Also, because the teen was killed by one of the first bullets, they said, the rest of the shots are legally irrelevant. The defense described a chaotic scenario in a dangerous area along the border known for smuggling, where “rockings” are not uncommon. Swartz testified he had to make a split-second decision and elected to defend himself and his fellow law enforcement officers that night. No other law enforcement officers on the scene fired their weapons. The question of whether she can sue is pending before the U.S. Supreme Court, which asked last month for the views of the Trump administration on whether a Border Patrol agent can be held liable in civil court for the shooting through the border fence. Supporters of the family question the defense’s use of an anonymous FBI informant, who said he talked to two people who said Elena Rodríguez had been working with them. Family members insist the teen was simply walking home that night. They wonder why James Tomsheck, former head of international affairs for Customs and Border Protection, wasn’t called to testify. In a 2016 New York Times story, Tomsheck was quoted saying the shooting was “the most egregious” of any excessive-force cases he had seen. The video footage from the scene, which he saw within a week of the incident, “demonstrated that José Antonio was certainly not throwing rocks at the time he was shot,” Tomsheck said. “All that’s left for us is to protest. We can’t expect any justice here, that is clear,” he said after Wednesday’s court hearing. Minutes later, Boren started chanting “for justice” right outside the doors of the federal courthouse. After being asked several times to move back, he was arrested by Federal Protective Services officers. “We want justice!” Boren continued to chant.